We started Surf Steps 10 years ago and, by doing so, pioneered the first surf school on the Hampshire/Dorset coast. A lot of people said “it’ll never work”, but we believed in the dream – and we’re still here! Along came SUP, so we did the same and set out to see where it could lead to. We weren’t exactly SUP development leaders in the early days of the sport; there were many other excellent groups and organisations developing SUP at the same time. Although looking back, pre-2011 we were working in relative isolation, which made it hard but rewarding to achieve what we did. We sure learnt a lot! We were involved with a charity called Surf Relief, who used adaptive equipment to give children with disabilities a great in-water surfing experience. We used really large surfboards, put the students on the front, paddled into waves and, with the instructor/guide at the back, surfed in tandem. 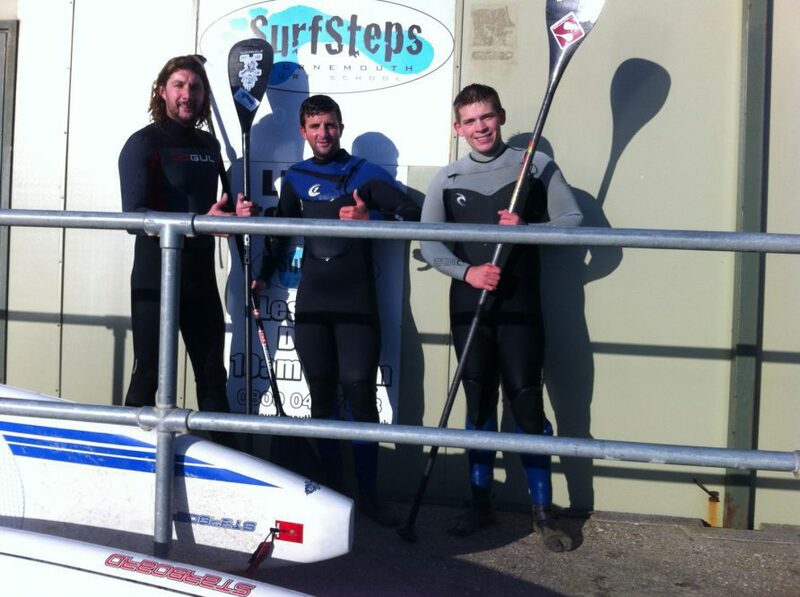 To help us provide the sessions locally in Bournemouth, Surf Relief gave us a tandem board. We started seeing SUP media, mainly from the States. Paul Clarke, from the now closed Bournemouth Surfing Centre, landed some SUP gear in Bournemouth. Paul invited me to have a go and we paddled together a few times on his new SUP gear. We could certainly see the potential. It’ll be perfect for us as a flat water alternative to surfing, it has a generally easier initial progression and a chance to wear those board shorts and bikinis on the water without freezing! The South Coast goes flat for ages and a lot of the original Bournemouth SUP Crew come from a surf background. I believe most of us used SUP initially to keep fit, have fun and get in (on) the water more often. For many of us, it led to a shift in our focus. Here’s our first paddleboard. The tandem board from Surf Relief. 11ft x 28” wide, shown next to a 10ft x 34” whopper. Narrow! Our fiirst paddle – made of wood, from Alder Sportswear. Who knows where they got it from, it’s certainly one of a kind. The blade was not symmetrical in its outline shape and looks like a spoon! 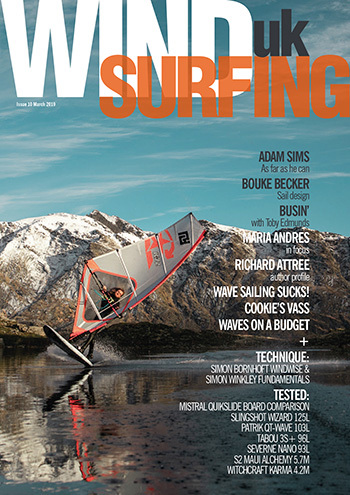 April 2008: Where are we going to get soft SUP boards from? At the time, and coming from a surfing school background, we though soft skinned SUP boards were the only option. I realise now, due to no incidents at the school and general acceptance, that hard boards are ok to teach beginners in flat water. Enter Liquid Shredder. We had just tried their boards for adaptive surfing with Surf Relief. Soft skinned, they were constructed from an EPS core with wooden stringers and then covered in a vinyl skin. Unfortunately on our flint covered beach they eventually ended up more patched than original! Though they let in water, they were buoyant. They were so heavy at the end of a session you had to drain the water out before you could lift them up. Next we added in some Ainsworth alloy paddles and… BOOM! We were ready to provide SUP lessons for customers. Summer 2008: SUP lessons and the learning curve! We had fun times learning the ins and outs of providing SUP sessions. Starting off a tour with the wind behind us only happened once; we ended up having to transport the students and equipment back by vehicle. Upwind isn’t so easy at the end of the session when you have to return! Group control was an eye opener. While you were looking after the slower members of the group, the faster, more able ones would disappear off into the distance! I remember a ‘coach of ours’ (ok, it was me!) having a group spread over a half kilometre radius and having to paddle over and lead them back, one by one. Never to be repeated! Ever towed someone on a SUP, tail first? It’s exhausting! All our boards now have d-rings or holes in the front to allow coaches to tow people and their boards using the leash, with the board facing the right way round. This period was quite a quiet time in regards to flat water development for us, mainly involving fine-tuning of our services and equipment. The big thing we were doing at this time was getting into surf SUP. Coming from 32 years of surfing I thought it would be easy… Not so much! It was like going back to being a first timer. We had many laughs whilst falling off and missing waves. 2011 brought lots more developments, especially SUP racing. I saw my first race boards and bought my first carbon paddle. 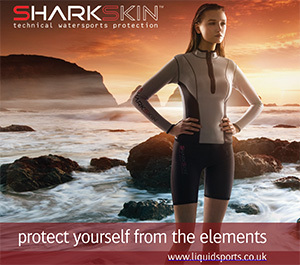 We started getting involved in providing safety cover at races and events with BaySUP. We learnt how to set courses up and important lessons; one being to not use large inflatable buoys in strong off-shore winds. In the sea, you might never see them again! We started our relationship with Tushingham, buying our first hard SUP boards from them (Starboard Whoppers and Atlases). The support we had from them was fantastic; if we needed help, we got it! Marketing, support, logistics and equipment, all from the dedicated, passionate, fun and friendly team. We continued to get this support as we moved onto the Red Paddle Co. inflatables. iSUPs have been an amazing equipment development for our school. They’re safe, light, incredibly tough and easy to store. Some of the boards we have are four years old, and we’ve never had to fix a puncture or the structure. On our flint covered beach at Boscombe, that’s hard to beat. 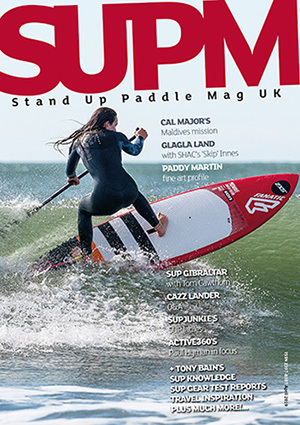 SUP has changed our operation and all the people involved so positively. The only frustration now is that we have to do whatever suits the conditions as we don’t often use ‘back beach’ alternative location options. For most of our new beginner customers, if the sea’s rough or windy we surf and if it’s flat and calm we SUP. It works out well as customers, staff and indeed the sports benefit from people doing both. It’s funny to think that we had to convince people that SUP was great fun when we started. Now we get customers who only want it and won’t consider surfing! We pride ourselves on getting more people in the water and, most importantly, getting the experience right for first timers. But it’s what to offer people who want to SUP after this that will be crucial for the future development of the sport. We’re finding and laying out clearer pathways to develop along, from first timer to expert – whether it’s on flatwater, in the surf or the open sea. Based on this we are developing specialist courses in different locations, offering coaching and technical info for flat water, surf and open water with downwind sessions. Looking back on our SUP history, we’ve learnt that if you develop in isolation, your determination, inspiration and ability to work hard is strengthened. We also learnt to get guidance, help and share experiences with others and found our SUP services developed rapidly. One of our main aims is to help your development in SUP – want to progress safer, faster, with better information and technique or perhaps even get into coaching? Then get in touch!